Dr. Harvey Ballard started studying northeastern violets in high school. During his PhD work he stepped back to investigate Viola groups worldwide. At Ohio University he launched into family-wide studies of the 30 genera and have been completing those over the last decade. Lately Dr. Ballard has gotten reacquainted (more intimately) with northeastern violets in the field and herbarium, and has finished the violet treatment for the upcoming new “Gleason and Cronquist” manual of vascular plants. His students and collaborators have also been using some new genetic markers (microsatellites) to clarify hybridization patterns and species distinctions in certain groups. Lugene Bruno. Since 1996, Ms. Bruno has held a position at the Hunt Institute where she has immersed herself in the botanical art and library collection. She is responsible for all activities of the Art Department, and curates the Art collection and twice-yearly exhibitions in the Institute’s gallery. She designs the exhibitions and companion catalogues; provides talks and tours related to collection items; responds to research requests; and makes available for study selections of the Art collection to visiting scholars, students and botanical artists. She is an honorary member of several botanical art and florilegia societies in the United States and abroad. Sarah Chamberlain conducts collaborative research studies on plants for Riparia, a research center at Penn State. She has taught numerous workshops on plant identification and frequently lectures on plant-related topics. She has authored a number of materials to aid in the identification of grasses, sedges, and rushes. Ms. Chamberlain maintains Riparia’s reference collection of more than 200 wetland sites in Pennsylvania, as well as the center’s reference and teaching herbaria. Current projects include authoring a Field Guide to Grasses of the Mid-Atlantic and a study of the flora of the Pingo Scars of Central Pennsylvania. Dr. Don Davis is a Professor of Plant Pathology at Penn State. He has received various awards and has served as a Senior Fulbright Scholar to both The Netherlands and Australia. Dr. Davis currently teaches 2 courses, advises 4 graduate students, presents guest lectures, and conducts research in several areas related to forest pathology at Penn State. Dr. Davis’ lab is currently researching biocontrol of the highly invasive tree-of-heaven (Ailanthus altissima) using native pathogenic fungi, with emphasis on risk analysis of non-target (non-Ailanthus) plant species. Dr. Jim Finley, Ibberson Professor of Forest Resources, Director of the newly founded Center for Private Forests at Penn State, and Pennsylvania extension forester, conducts research and extension education programs on people and sustainable forest resource management focusing private forestland. Major research efforts include oak regeneration, human dimensions of natural resources, and sustainable forestry. He is the Co-Founder of Penn State’s Human Dimensions of Natural Resources and the Environment Dual Title Graduate Degree Program, and Senior Research Fellow for the Pinchot Institute for Conservation. He serves on the Western Pennsylvania Conservancy, Eden Hill Conservancy, and Foundation for Sustainable Forest boards. Dr. John Kartesz. Born and raised in western Pennsylvania, for nearly a half-century Dr. Kartesz has dedicated his life toward developing the largest relational database of vascular plants for North America, north of Mexico. He has published numerous books and articles on the flora and manages the only comprehensive system for assessing the phytogeography and taxonomy of the entire vascular flora for the continent. He is the Director of the Biota of North America Program and has worked closely with nearly all of the U.S. federal government agencies to produce such work as the USDA Plants Database and the National Wetland Plant List. Dr. Larry Klotz. During his career as a Professor of Biology at Shippensburg University Dr. Klotz has taught several botanical courses including “Plant Taxonomy” and “Algae and Aquatic Plants”. He has more than thirty years of experience performing vegetation surveys and plant searches for the Pennsylvania Natural Heritage Program, the National Park Service, and many environmental consulting firms. His research interests have included studies of barrier island flora, seasonal pond vegetation, and plant systematics. Dr. Chris Martine is the David Burpee Chair in Plant Genetics & Research and Director of the Manning Herbarium at Bucknell University, a post he assumed after six years on the faculty at SUNY Plattsburgh following his PhD work at the University of Connecticut. Chris is an evolutionary biologist, ecologist and botanist with a passion for natural history — something he strives to promote in his YouTube series, “Plants are Cool, Too!” and through his blog entries for Huffington Post. He has published two field guides, “Trees of New Jersey” and “Shrubs and Vines of New Jersey,” through the NJDEP. Dr. Jim McGraw has a BS in Biology from Stanford University and a PhD in Botany from Duke University. For the past 20 years, his lab has focused on the ecology and population biology of medicinal plants, with a primary focus being wild American ginseng populations. He and his students have used ginseng to study the environmental challenges faced by plants, both natural and human-caused, ranging from climate change to invasive species, and human harvest to over-browsing by deer. Dr. Anton A. Reznicek (Tony) is Curator of Vascular Plants at the University of Michigan Herbarium. A world-renowned expert on the sedge family (Cyperaceae), Tony has written extensively on sedge systematics, especially in the New World, including treatments of many sections in the Flora of North America. He has published extensively on various aspects of plant systematics and especially Great Lakes region flora and phytogeography, and in 2012, authored with Ed Voss, the Field Manual of Michigan Flora. A strong advocate for conservation, Tony has been generous in lending his expertise to land trusts and conservation science organizations. In 2012 Tony received a Lifetime Achievement Award from the Michigan Botanical Club, as well as the inaugural Edward G. Voss Conservation Science Award from the Michigan Nature Association (awarded to both Reznicek and Voss). 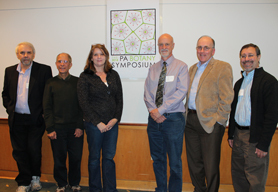 Thank you to the many presenters who made the 2014 Pennsylvania Botany Symposium a huge success! Some of our presenters are pictured below (L to R: John Kartesz, Larry Klotz, Sarah Chamberlain, Jim McGraw, Jim Finley and Harvey Ballard). Missing from the photo are Tony Reznicek, Lugene Bruno, Don Davis and Chris Martine.